The supermodel with the fastest rise to the top of the industry is indisputably Natalia Vodianova. She continues her blue chip legacy with past work for Vuitton as well as representing Chanel beauty, even as her Calvin Euphoria fragrance contract continues its run. She will always be most wanted. The new hire of French lingerie company Etam still works for mother Russia through her charitable foundation. Natalia Vodianova is one of the clearest examples of rags to riches: She was raised in an impoverished family in Russia before becoming an international model. In addition to her work for Calvin Klein fragrance, Guerlain and jeweler Jacob & Co., the 27 year old signed a three year contract with Etam. She is the brand's ambassador and will also design a collection each season. She runs the Naked Heart Foundation, a charity that raises money to provide playgrounds in Russia. Born in Gorky USSR (now Nizhny Novgorod, Russia), Natalia Vodianova grew up in a poor district of the city with her mother and two half sisters, one of whom has cerebral palsy. As a teenager, Vodianova helped her mother sell fruit on the street and later set up her own fruit stand with a friend to help her family out of poverty. Natalia Vodianova's father walked out on the family when Natalia was a toddler, and she did not have any further contact with him until after she had become famous. At the age of 15, Vodianova enrolled in a modeling academy and was told she would need to learn English to succeed, and mastered the language in three months. By the age of 17, Vodianova had moved to Paris in order to continue her modeling career. Natalia Vodianova has achieved considerable success as a runway, editorial and advertising campaign model. To date, Vodianova has walked in more than 175 runway shows for U.S. and European based designers' ready to wear and haute couture collections, has appeared in editorial spreads in fashion magazines worldwide and has completed advertising campaigns for Calvin Klein, Louis Vuitton, Yves Saint Laurent, L'Oreal, David Yurman, Marc Jacobs, Pepe Jeans, Diane Von Furstenberg, Chanel, Guerlain, and many others. Natalia Vodianova has appeared on the cover of British Vogue seven times; the first was the September 2003 issue. She made her first appearance on the cover of the U.S. Vogue in the September 2004 edition alongside eight other models, then appeared as the solo cover subject of the July 2007 edition of the magazine. 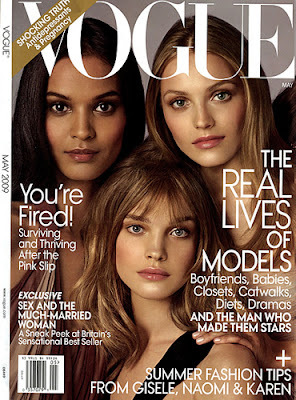 During this time period, other covers of the American Vogue have all featured non-model celebrities with only two other exceptions: models Linda Evangelista and Liya Kebede.